Dr. Simon Raif Morkos has obtained his MBBS from Academy of Medicine. He later obtained his MD from the same university in the year 2001. He continued to achieve his specialist degree in OBG and diploma in Operative Endoscopy in Gynaecology from University of Clermont-Ferrand, France. He also earned a diploma in Hysteroscopy from University of Paris and a diploma in Reproductive Medicine and Biology from University of UFR Saint-Antoine, Paris, France. 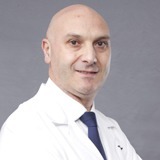 Dr. Simon Raif Morkos has more than 14 years of experience in the field of Obstetrics and Gynaecology and worked in many international hospitals in France, Lebanon and UAE. Dr. Simon areas of interest are Obstetrics & Gynaecology, Laparoscopic & Hysteroscopic Surgeries and Infertility and Reproductive Medicine. Dr. Simon has several publications, articles, clinical research and achievements under his belt. He has also attended over 13 courses, seminars and conferences. Dr. Simon is well versed in French, Russian, English and Arabic.